Ashes of Creation Apocalypse logo. Ashes of Creation Apocalypse (also referred to as Alpha-1 phase 1 and APOC) will focus on the action side of combat. Ashes of Creation Apocalypse is a matchmaking-based arena style testing phase with three primary game modes. Possibly a revised Weapon use ability system. Ashes of Creation Apocalypse testing modes will be implemented side-by-side with Ashes of Creation. Use the Character creator to create and save characters for use in the full game. Establish Player housing and save Furniture arrangements for use in the full game. Alpha-1 testers will test each arena mode for a month before that mode is granted to all registered users. This mode will continue during development and post launch. Ashes of Creation Apocalypse environment. Ashes of Creation Apocalypse environment preview (in-Game). Ashes of Creation Apocalypse environments part 2. Ashes of Creation Apocalypse arena stress test (NDA). Ashes of Creation Apocalypse battle royale (NDA lifted). Ashes of Creation Apocalypse open beta. Ashes of Creation Apocalypse castle siege mode. To be announced. Ashes of Creation Apocalypse horde mode. To be announced. 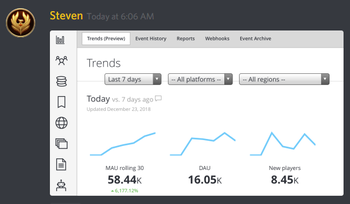 Statistics from the December 2018 testing of Ashes of Creation Apocalypse. There were 86,000 registered logins from unique accounts. 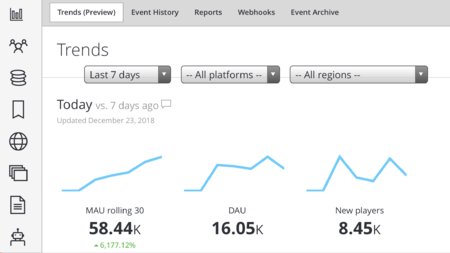 There were 16,000 daily active users (DAU). There were approximately 3 - 4,000 concurrent users each day. 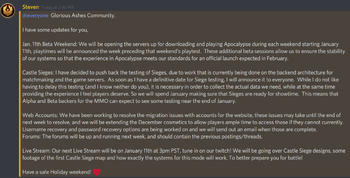 Testing of Ashes of Creation Apocalypse arena (battlegrounds/BR mode) will proceed as follows. Alpha-2 testers will be invited starting 19 October 2018 at 6:30PM (PDT). Alpha-0, Beta-1 and Beta-2 testers will be invited in the following weeks. Finally, testing will be opened to all registered users. 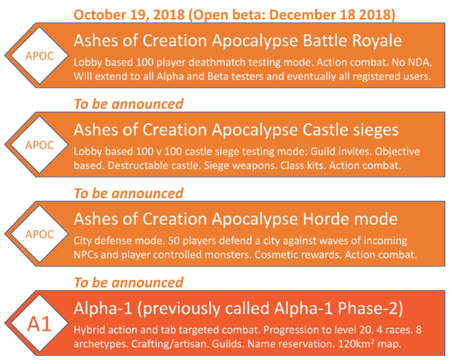 Ashes of Creation Apocalypse castle sieges and Ashes of Creation Apocalypse horde mode testing schedules will be similar. Alpha-1 testers will test for the first month. Alpha-2 testers will be invited following that. All other backers will be invited afterwards. Only Alpha-1 testers gain access to Alpha-1. Ashes of Creation Apocalypse testing participation. First wave of invite emails were sent September 5, 2018. Testing began September 7, 2018. 250+ people in the first wave. Second test wave was Thursday 13th and Friday 14th September 2018. 1,250+ testers as of September 13, 2018. Third test wave invites sent Wednesday 19th September 2018. All alpha-1 testers following that. All 10,000 Alpha-1 backers invited to the stress test. Ashes of Creation Apocalypse battle royale corruption storm approaching. 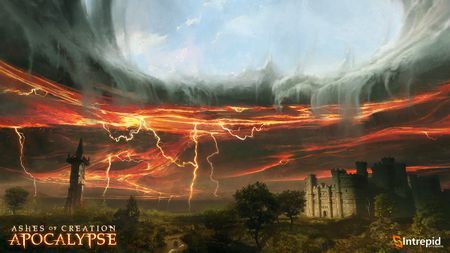 Corruption storm circle timings in Ashes of Creation Apocalypse battle royale. 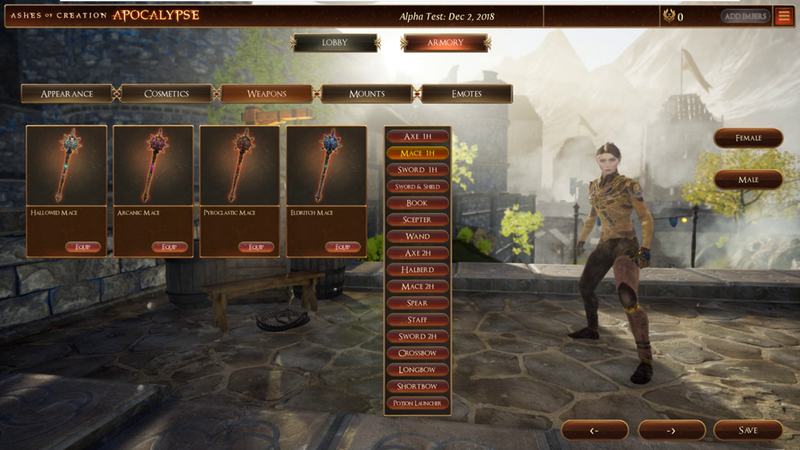 Ashes of Creation Apocalypse siege equipment includes ballistas, trebuchets, battering rams and potentially traps and "powder keg" type weapons. Siege weapons available to the attacking side include Trebuchets and Battering Rams. Siege weapons available to the defending side include Ballistas and Traps. 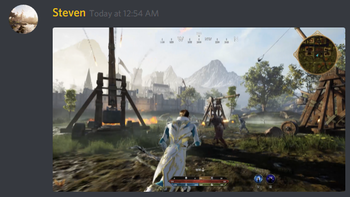 Siege weapons are deployable and piloted by players. 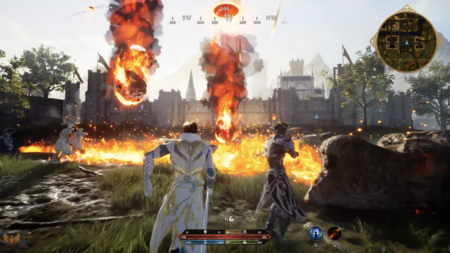 Ashes of Creation Apocalypse horde mode is an Ashes of Creation Apocalypse testing mode where 50 players defend a city against waves of incoming NPCs and player controlled monsters. Each wave is more difficult than the last. Between waves, players collect experience, money and weapons to take back to their hold to defend against the next wave. Monster coins enable players to join the game as part of the horde. Horde mode will include adaptive AI boss mechanics. Rewards are obtained dependent on progress against these NPCs. Pet versions of the defeated NPCs. Horde mode is specifically for testing. Testing the blackboard for the AI. Ashes of Creation Apocalypse first look at action combat. 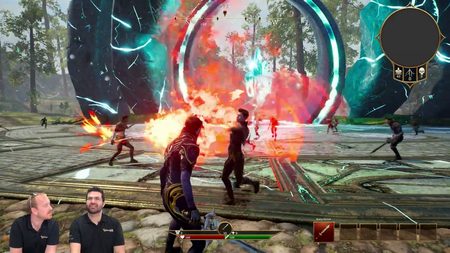 Ashes of Creation Apocalypse is based on action combat. Ashes of Creation Apocalypse combat targeting reticle. 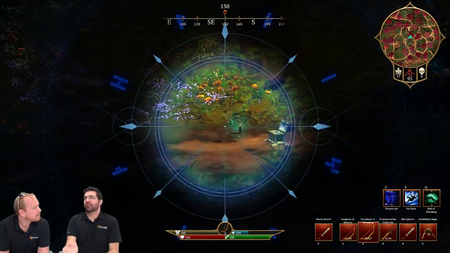 Action combat in Ashes of Creation Apocalypse utilizes a targeting reticle. A hot key can be used to toggle reticle mode on and off. Left mouse click is used for basic weapon attacks. Right mouse click is used as a "focus" button. It can also be used to activate root motion attacks for melee. Combat targeting uses hitbox registration in three separate regions: Upper body, lower body and head. Certain weapons and skills have ADS (Aim Down Sights) functionality. Alpha-1 will test hybrid action/tab combat. The Ashes of Creation MMORPG will have a time-to-kill (TTK) of around 30 seconds to a minute. 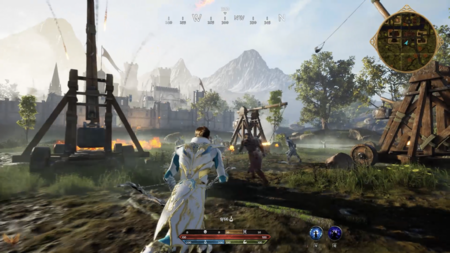 Time-to-kill in the Ashes of Creation Apocalypse battle royale testing mode is adapted for a traditional Battle Royale setting. The developers do not want one-shots in the final MMORPG. Headshot mechanics will be implemented in Ashes of Creation based on testing. If headshots are implemented, they will be along the lines of a higher critical chance. Headshots in action combat are equivalent to a critical hit in tab targeted combat. Players relying on tab skills will have a fixed critical hit chance every time they use an ability or weapon. Players using action-based skills are going to rely on getting a head shot or hitting a critical spot on the opponent. 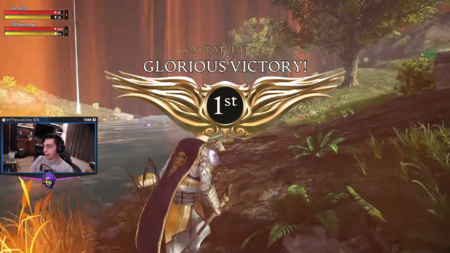 There is a Shield in Ashes of Creation Apocalypse that has its own hit box with hit points (HP). 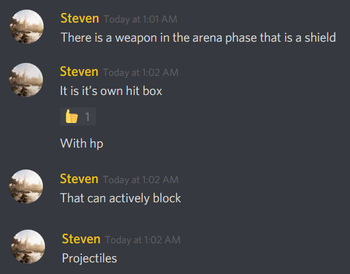 This shield can actively block projectiles. Player corruption is expected to be implemented in Alpha-1. Ashes of Creation Apocalypse combat animations are work-in-progress. Classes in Ashes of Creation Apocalypse castle sieges and Ashes of Creation Apocalypse horde mode. Emblem designs by Ryan Richmond. Six classes will be present in Ashes of Creation Apocalypse castle sieges and Ashes of Creation Apocalypse horde mode. These classes relate to the trinity of classes: Tank, DPS and Support. Weapon skills are applied to augment a class' base skills. 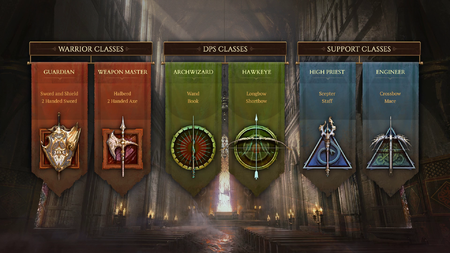 Base class skills may be able to be selected from a host of available skills for that class based on a player's progression within that season. Ashes of Creation Apocalypse classes only apply to Ashes of Creation Apocalypse castle sieges and Ashes of Creation Apocalypse horde mode. 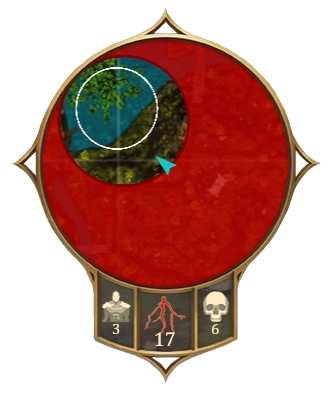 Healing in Ashes of Creation Apocalypse will be reticle based (action targeted). Healing skills are proximity based: Centered on self or centered on projectile impact. There will be healing potion bursts (healing grenades) that will grant life to allies. Healing is part of Class kits that come into play during the testing of Ashes of Creation Apocalypse castle sieges. The first chapter of Apocalypse is The Exodus. It takes part in the initial stages of the fall and sets the scene for upcoming chapters. A new chapter will be released every 10 weeks. Between 15 and 20 cosmetic rewards are earnable in every chapter. Daily and weekly quests will allow players to gain up to 50 levels (matching the intended level cap for the Ashes of Creation MMORPG). Advancing through these levels allows players to unlock unique cosmetic rewards, such as weapon skins. Divine gateway in the Ashes of Creation Apocalypse battle royale (BR mode) staging area. Some unlucky citizens didn't quite make it through the gateways in time and fell back to the planet to fight for survival. This underpins the battle royale mode. Certain citizens are fighting for control over Castles that they believe to be last bastions of defense against the forces of corruption. This underpins the castle siege mode. The last stand against the forces of corruption takes place in the horde mode. 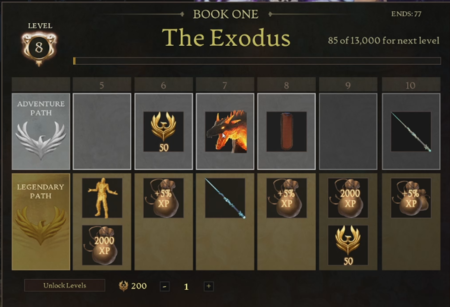 Ashes of Creation Apocalypse lore is split into chapters. Currently every ten weeks a new chapter will be released. Chapter 1 is called The Exodus. It takes part in the initial stages of the fall and sets the scene for upcoming chapters. Ashes of Creation Apocalypse quests. Questing in Ashes of Creation Apocalypse contains lore that gives insight to the happenings on Verra during the fall. 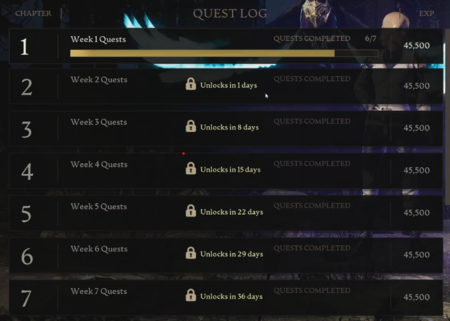 Daily and weekly quests allow players to gain up to 50 levels. Leveling allows players to unlock unique cosmetic rewards, such as weapon skins. Days and weeks end at midnight UTC, with weeks ending on Sunday, 23:59. These quests give lore that relates to the story of Verra during the fall, thousands of years before the start of the MMORPG. Ashes of Creation Apocalypse adventure paths. There will be adventure paths in Ashes of Creation Apocalypse (Battle royale, Castle sieges, Horde mode). The first chapter of Apocalypse is The Exodus. Between 15 and 20 cosmetic rewards are earnable in every chapter. There will be an optional Legendary Path that players can purchase for USD $10 per 10 weeks. The Legendary Path offers over 50 cosmetic rewards. 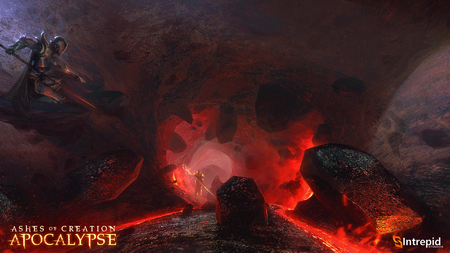 Alpha-1 backers and Intrepid pre-order pack owners will be granted lifetime access to the Legendary path. Alpha-2, Beta-1 and Beta-2 backers will have access to the first chapter's Legendary path, with over 50 cosmetics available to earn. Kickstarter, summer backers and pre-order pack owners will receive the first chapter of the legendary path for free for 70 days. 71 different cosmetic rewards can be earned starting from December 18th. The Legendary path will also have a shop for one-off cosmetics. Embers can be used in Ashes of Creation Apocalypse to purchase unique cosmetics or to purchase the Legendary adventure path. All Adventure paths in Ashes of Creation Apocalypse allow players to earn embers just for playing. Those embers will carry over into the MMORPG. 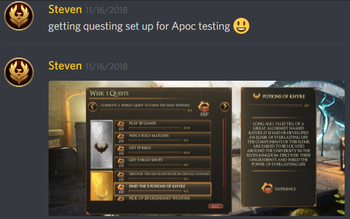 Progression and experience tracking for participation in Ashes of Creation Apocalypse testing will entitle players to achieve unique cosmetic rewards. These earned rewards will carry over in player's accounts to live launch. 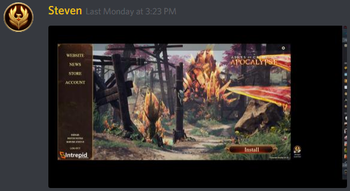 The account used for Apocalypse is the same account used for the MMORPG. Unique skins earned in Apocalypse will be added to the MMORPG as rewards for helping to prepare for the Alpha and Beta stages of Ashes of Creation. 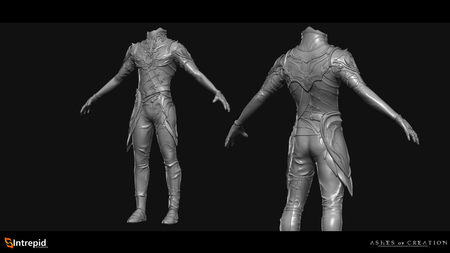 Cosmetic skins are only be able to be applied to things that have already been earned, crafted or found within the Ashes of Creation MMORPG. 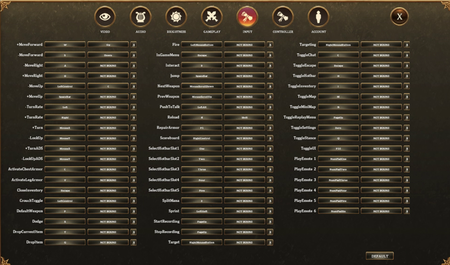 Skins earned in Apocalypse will be available to apply at certain tiers, levels and/or access points within the MMORPG. These cosmetics reflect the lore of Ashes of Creation Apocalypse, which is set before the fall. Armor appearances will reflect the ancient cultures of Verra. Examples of some Kickstarter rewards will be included in Ashes of Creation Apocalypse. A cosmetic sign-up gift will be implemented during Ashes of Creation Apocalypse. This will apply to all regions and all currently registered accounts. The gift will be a cosmetic accessory. Weapons and Armor are tied to skills in Ashes of Creation Apocalypse. Swapping between weapons will allow players to access the different skills on their hotbar. 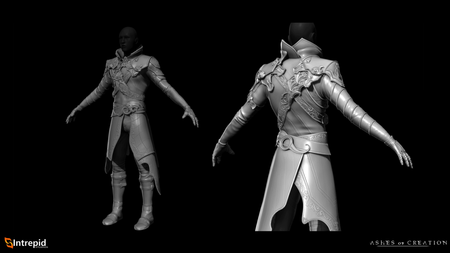 Certain armor pieces have utility and defensive skills, such as like Camouflage, Polymorph and Battlefield wall. Weapons are tied to one specific skill in early testing, but this may change. Ashes of Creation Apocalypse weapons and abilities get better with each tier. Ashes of Creation Apocalypse weapons each have an associated ability. Each weapon has three different tiers. Ranged weapons are currently hitscan based, with the exception of Nightfall, which is projectile-based. Melee weapons are currently cone hitscan based. Alacrity For the duration of this stance, your successful attacks will increase your run speed. Bolt of Revealing After activating this spell, the next bolt you fire will reveal all characters hidden by terrain, structures, or invisibility in its area of effect. Chain Lightning Activate to charge your attacks with lightning - each hit can then arc between foes, dealing damage to each one. Chaos Meteor Summon a meteor. Comes with an ADS (Aim Down Sights) capability. When Chaos Meteor explodes, it breaks into 2-5 magical shards, each of which has a random effect across a very large area. 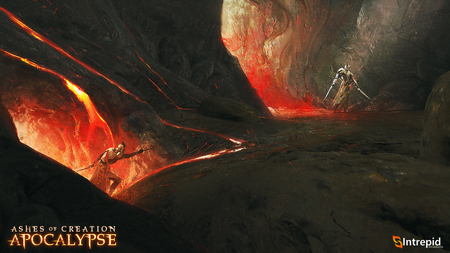 Crimson Blast This spell will invoke a destructive cone of force and flame at enemies in front of you. Darkness When activated, your next arrow will explode in a cloud of darkness on impact. Divine Light For the duration of this spell, your attacks will mark your foes with a divine light that can be seen for miles. Divine Protection For the duration of this stance, you will take cover benind your shield's enhanced protection. Fire Potion Generates a fire explosion. Frost Potion Swap your explosive potion for a potion of frost. It will burst on the first bounce, leaving an area of bitter cold that slows your enemies. Hemorrhage For the duration of this stance, any hit will apply a debuff to your enemies, dealing damage to them with every step they take. Lifesteal For the duration of this stance, your successful attacks will steal life from your foes, and render it unto you. Miasma After you activate this spell, your next arrow will summon a dark miasma that clings to any foes that touch it, dealing damage over time. 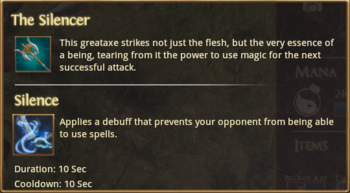 Silence Applies a debuff that prevents your opponent from being able to use spells. Stamina Drain For the duration of this stance, your attacks will drain your opponent's stamina and stop their stamina regen for 5 seconds. Stillblade ability For the duration of this stance, your attacks will slow your opponent's movements. Warp Space For the duration of this spell, any successful hit will swap your location with that of your target. 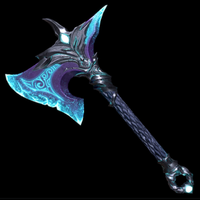 Basic axe. Hallowed Bronze Axe. Arcanic Bronze Axe. Pyroclastic Bronze Axe. 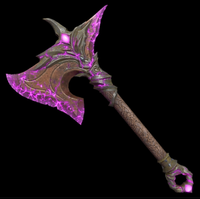 Eldritch Bronze Axe. Thundering Mace. 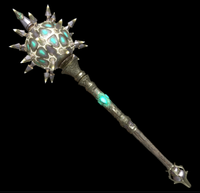 Hallowed Mace. Arcanic Mace. Pyroclastic Mace. 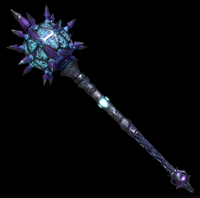 Eldritch Mace. A revised weapon use combo system may be present in Alpha-1. The weapon use ability that was originally shown at PAX West 2017 was reduced to a basic form in Alpha-0. Ashes of Creation Apocalypse base leather armor set concept art. Ashes of Creation Apocalypse armor comes with associated skills/abilities. There are two types of armor: Upper and lower body. In Ashes of Creation Apocalypse battle royale armor that has lost its damage mitigation can be recharged/repaired to restore damage mitigation points. In Ashes of Creation Apocalypse castle sieges armor can be replenished by an Engineer. There may also be items in the world or objectives that replenish armor for the entire team, such as one of the buffs for taking a control point. In Ashes of Creation (the MMORPG) armor does not function as a pool. There will be no armor bar as seen in Ashes of Creation Apocalypse. 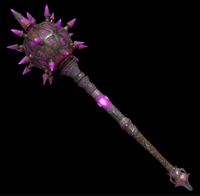 Arcanic Power Channel raw arcane energies to instantly knock nearby foes back, deal damage, and give yourself some breathing room. Blink Activate to instantly teleport yourself a short distance forward. Bulwark This spell will instantly summon a wall a short distance in front of the caster. Perfect for deploying as a cover! Catfall Activate to grant yourself exceptional jumping abilities, silent moving, and protection from falling damage for the duration. Dark Pact For the duration of this spell, you will be immune to the effects of the corruption storm. Icy Steps With this spell you will leave icy trails behind you, which will snare and slow your enemies. Invisibility This spell turns you invisible for the duration, though it will cancel upon attacking, or through the use of any other spells. Polymorph Transform yourself into a harmless inanimate object, and disappear into the local terrain. Will cancel on movement or attack. Mana-forged armor sets may be achievable in the Ashes of Creation MMO. 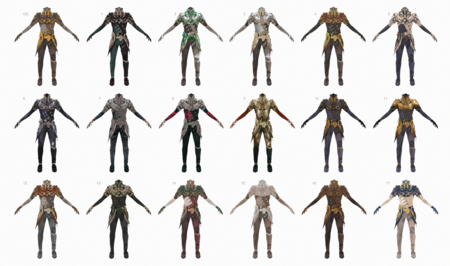 They also appear to be base variants of Ashes of Creation Apocalypse armor sets. Kaelar base level Ashes of Creation Apocalypse robe set. 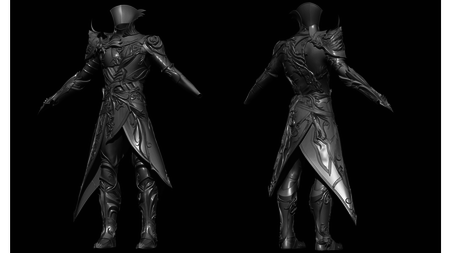 Empyrean level 20 (tier 3) plate armor. 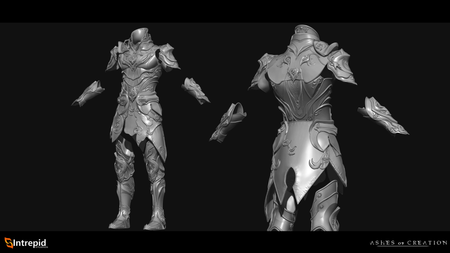 Kaelar level 20 (tier 3) plate armor. Ashes of Creation Apocalypse will have three different armor themes: Plate, leather and robe. 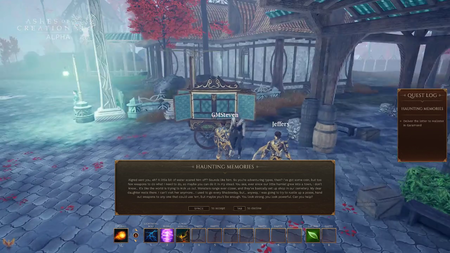 Ashes of Creation Apocalypse players can establish Player housing and save Furniture arrangements for use in the full game. Ashes of Creation Apocalypse arena will include an early access Character creator. Create and save characters for use in the full game. This was previously slated for Alpha-1. Ashes of Creation Apocalypse minimum system specification. Ashes of Creation Apocalypse launcher. Ashes of Creation Apocalypse UI. Image credit: The Ashes Post. 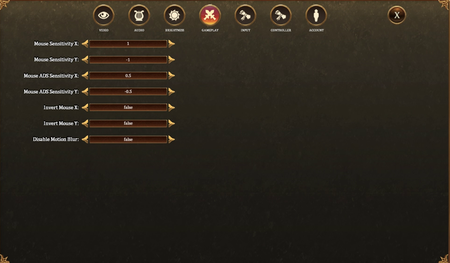 Alpha-1 quest user interface preview. The Ashes of Creation user interface (UI) is built with customization in mind. Alpha-1 castle siege combat featuring a mini-map and compass UI. Ashes of Creation Apocalypse battle royale mini-map UI. Image credit: The Ashes Post. There is an in-game mini map and compass user interface in Alpha-1. The Ashes of Creation Apocalypse camera is a tied third-person view, over the shoulder, for the purposes of reticle specific zoom options and aim-down-sights. This is solely intended for the current action combat. Ashes of Creation Apocalypse input settings. Ashes of Creation Apocalypse gameplay settings. Ashes of Creation Apocalypse default keybinds. Image credit: The Ashes Post. Players are able to customize their keyboard control scheme. 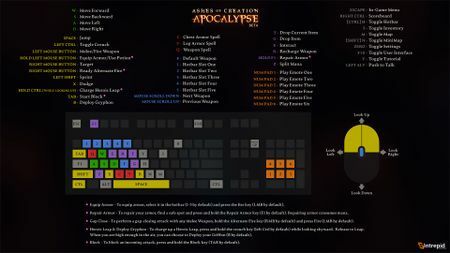 Ashes of Creation Apocalypse includes hotkey customization (keybinds). Testing Ashes of Creation Apocalypse controller support. 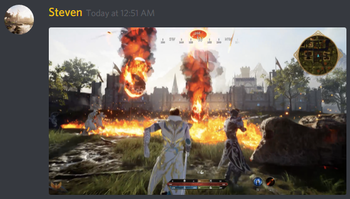 Ashes of Creation Apocalypse may have controller support. The Ashes of Creation MMO is not designed around controller support. The AOC Dungeon - Welcome to Verra! ... It’s Time to Break the World. The Ashes Post - Alpha 1 Battle Royale Guide. AoC wiki Battle Royale guide. ↑ 2.00 2.01 2.02 2.03 2.04 2.05 2.06 2.07 2.08 2.09 2.10 2.11 2.12 2018-12-08 Newsletter. ↑ 3.0 3.1 Livestream, 31 October 2018 (35:00). ↑ 5.0 5.1 Podcast, 4 August 2018 (1:07:59). ↑ 6.0 6.1 6.2 6.3 6.4 6.5 Interview, 24 August 2018 (13:17). ↑ 7.0 7.1 7.2 7.3 7.4 7.5 7.6 Livestream, 17 August 2018 (30:29). ↑ Livestream, 27 September 2018 (9:08). ↑ 9.0 9.1 Podcast, 11 May 2018 (57:42). ↑ 10.0 10.1 10.2 10.3 10.4 10.5 Livestream, 1 September 2018 (1:05:10). ↑ 12.0 12.1 12.2 12.3 12.4 12.5 12.6 12.7 12.8 12.9 Livestream, 31 October 2018 (38:47). ↑ Ashes of Creation Apocalypse registration. ↑ Video, 9 July 2018 (0:01s). ↑ Livestream, 17 August 2018 (58:53). ↑ 16.0 16.1 16.2 16.3 16.4 16.5 16.6 16.7 16.8 16.9 Livestream, 1 September 2018 (54:06). ↑ Press release - Ashes of Creation Apocalypse Launches December 18. ↑ 22.0 22.1 Livestream, 8 March 2019 (1:02:45). ↑ 29.0 29.1 Livestream, 27 September 2018 (9:50). ↑ 41.0 41.1 41.2 41.3 Livestream, 1 September 2018 (56:11). ↑ 44.0 44.1 Livestream, 27 September 2018 (24:09). ↑ 47.0 47.1 47.2 47.3 Castle Siege Overview. ↑ 48.0 48.1 48.2 48.3 Interview, 17 August 2018 (8:16). ↑ Livestream, 11 January 2019 (35:44). ↑ Interview, 8 August 2018 (20:49). ↑ 52.0 52.1 52.2 52.3 52.4 52.5 52.6 52.7 Interview, 8 August 2018 (4:00). ↑ 53.0 53.1 53.2 53.3 53.4 53.5 Interview, 17 August 2018 (18:53). ↑ Video, 17 August 2018 (0:01). ↑ Livestream, 27 September 2018 (17:52). ↑ 56.0 56.1 Livestream, 9 July 2018 (58:26). ↑ 57.0 57.1 Interview, 8 August 2018 (27:04). ↑ Interview, 17 August 2018 (3:58). ↑ 59.0 59.1 Interview, 17 August 2018 (4:31). ↑ 60.0 60.1 60.2 Interview, 17 August 2018 (6:03). ↑ Livestream, 8 April 2018 (PM) (41:44). ↑ 62.0 62.1 Interview, 20 October 2018 (3:25:46). ↑ 63.0 63.1 63.2 63.3 63.4 Interview, 20 October 2018 (9:10). ↑ 64.0 64.1 64.2 64.3 Livestream, 27 September 2018 (34:49). ↑ Interview, 8 August 2018 (18:55). ↑ 67.0 67.1 Livestream, 31 October 2018 (45:18). ↑ 68.0 68.1 68.2 Livestream, 11 January 2019 (41:20). ↑ Interview, 20 October 2018 (11:38). ↑ 70.0 70.1 Livestream, 11 January 2019 (58:40). ↑ Reddit Q&A, 8 January 2019. ↑ 72.0 72.1 Interview, 8 August 2018 (19:40). ↑ 73.0 73.1 Interview, 17 August 2018 (12:05). ↑ 74.0 74.1 Interview, 6 December 2018 (2:04). ↑ 75.0 75.1 75.2 75.3 75.4 75.5 75.6 Livestream, 6 December 2018 (28:45). ↑ 76.0 76.1 76.2 76.3 76.4 76.5 76.6 76.7 76.8 76.9 Livestream, 6 December 2018 (33:55). ↑ 77.0 77.1 77.2 77.3 77.4 77.5 77.6 77.7 Livestream, 6 December 2018 (26:12). ↑ 78.0 78.1 78.2 78.3 78.4 78.5 78.6 Livestream, 27 September 2018 (6:22). ↑ 79.0 79.1 79.2 79.3 Livestream, 31 October 2018 (36:59). ↑ Livestream, 6 December 2018 (14:32). ↑ 84.0 84.1 84.2 84.3 Livestream, 6 December 2018 (51:20). ↑ 85.0 85.1 Livestream, 6 December 2018 (1:00:52). ↑ 86.0 86.1 86.2 86.3 86.4 86.5 Livestream, 27 September 2018 (27:27). ↑ 88.0 88.1 88.2 Livestream, 6 December 2018 (41:43). ↑ 92.0 92.1 92.2 92.3 92.4 Interview, 17 August 2018 (6:53). ↑ Interview, 17 August 2018 (7:52). ↑ 94.0 94.1 Livestream, 27 September 2018 (22:02). ↑ 95.0 95.1 95.2 Interview, 20 October 2018 (2:24:21). ↑ Interview, 25 January 2019 (11:21). ↑ Livestream, 17 August 2018 (18:19). ↑ Livestream, 17 August 2018 (7:49). ↑ Livestream, 6 December 2018 (26:03). ↑ Livestream, 6 December 2018 (26:23). ↑ 117.0 117.1 117.2 117.3 Bronze Axe Skins. ↑ Livestream, 6 December 2018 (28:08). ↑ Livestream, 6 December 2018 (28:12). ↑ Livestream, 6 December 2018 (28:19). ↑ Livestream, 6 December 2018 (28:30). ↑ Livestream, 6 December 2018 (28:37). ↑ 123.0 123.1 123.2 123.3 Thundering Mace Skins. ↑ Livestream, 6 December 2018 (28:43). ↑ Livestream, 6 December 2018 (28:47). ↑ Livestream, 6 December 2018 (28:51). ↑ 127.0 127.1 Livestream, 18 January 2018 (22:46). ↑ Livestream, 27 September 2018 (23:00). ↑ 130.0 130.1 130.2 Livestream, 11 January 2019 (53:30). ↑ 142.0 142.1 Livestream, 17 August 2018 (20:19). ↑ 143.0 143.1 143.2 Livestream, 17 August 2018 (22:59). ↑ Livestream, 17 August 2018 (22:33). ↑ Livestream, 17 August 2018 (22:58). ↑ 146.0 146.1 146.2 Livestream, 31 October 2018 (40:31). ↑ Interview, 8 August 2018 (30:51). ↑ 148.0 148.1 Ashes of Creation Apocalypse: What are the minimum system requirements? ↑ Livestream, 31 October 2018 (22:09). ↑ Livestream, 5 May 2017 (20:02). ↑ Livestream, 15 December 2017 (1:09:36). ↑ 154.0 154.1 Livestream, 27 September 2018 (31:59). ↑ The Ashes Post Battle Royale Guide. ↑ Interview, 20 October 2018 (3:19:48). ↑ Livestream, 26 May 2017 (38:30). ↑ Interview, 8 August 2018 (27:38). ↑ Intrepid Studios Snapchat, 30 November 2018. ↑ Livestream, 17 November 2017 (21:24). ↑ Livestream, 8 April 2018 (AM) (18:04). ↑ Livestream, 31 October 2018 (45:01). This page's content was last modified on 20 April 2019, at 21:33.